A service of collation and installation for 10 new Canons was held at Blackburn Cathedral on Sunday 9 December at 4pm. 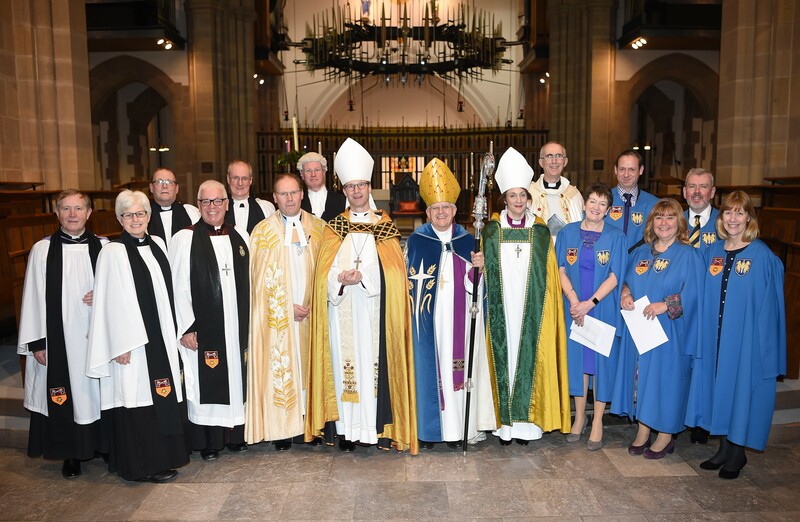 Clergy in the Diocese, Rev Grant Ashton, Rev Lawrence Carson-Featham, Rev Tim Horobin, Rev Linda Macluskie and Rev Chris Newlands became Honorary Canons of the Cathedral during a service led by Rt Rev. Julian Henderson, Bishop of Blackburn. Meanwhile Mrs Jean Duerden, Mr Richard Jones, Miss Jo Snape, Mr Stephen Whittaker and Mrs Sue Witts became Lay Canons of the Cathedral. Bishop Julian recently wrote to the Diocese about the occasion. Read Bishop Julian's letter here. Main picture - left to right - Rev. Lawrence Carson-Featham, Vicar of Accrington St Andrew, St Mary Magdalen, St Peter and Church Kirk; Rev. Linda Macluskie, Vicar of St John, Sandylands and St Helen Overton; Rev. Tim Horobin, Vicar of St James, Lower Darwen, St James Over Darwen and St Paul's Hoddlesden; Rev. Chris Newlands, Vicar of Lancaster Priory; Rev. Grant Ashton, Assistant Archdeacon of Blackburn and Vicar of Euxton; The Dean, the Very Rev. Peter Howell-Jones, Rev. Paul Benfield, Diocesan Registrar; Rt Rev. Philip North, Bishop of Burnley; Rt Rev. Julian Henderson, Bishop of Blackburn; Rt Rev. Dr Jill Duff, Bishop of Lancaster; The Ven. Mark Ireland, Archdeacon of Blackburn; Jean Duerden, Cathedral member and Diocesan Conference Administrator; Stephen Whittaker, Diocesan Director of Education; Jo Snape, Associate Adviser to the Board of Education and member of St Andrew's Cleveleys; Richard Jones, Headteacher at St Christopher's Accrington and Sue Witts, retired Children's Work Adviser and lay leader at St Paul's Hoddlesden.